Less energy is escaping to space: Carbon dioxide (CO2) acts like a blanket; adding more CO2 makes the 'blanket' thicker, and humans are adding more CO2 all the time. The proof that man-made CO2 is causing global warming is like the chain of evidence in a court case. CO2 keeps the Earth warmer than it would be without it. Humans are adding CO2 to the atmosphere, mainly by burning fossil fuels. And there is empirical evidence that the rising temperatures are being caused by the increased CO2. It is the Earth’s atmosphere that makes most life possible. To understand this, we can look at the moon. On the surface, the moon’s temperature during daytime can reach 100°C (212°F). At night, it can plunge to minus 173°C, or -279.4°F. In comparison, the coldest temperature on Earth was recorded in Antarctica: −89.2°C (−128.6°F). According to the WMO, the hottest was 56.7°C (134°F), measured on 10 July 1913 at Greenland Ranch (Death Valley). Man could not survive in the temperatures on the moon, even if there was air to breathe. Humans, plants and animals can’t tolerate the extremes of temperature on Earth unless they evolve special ways to deal with the heat or the cold. Nearly all life on Earth lives in areas that are more hospitable, where temperatures are far less extreme. Yet the Earth and the moon are virtually the same distance from the sun, so why do we experience much less heat and cold than the moon? The answer is because of our atmosphere. The moon doesn’t have one, so it is exposed to the full strength of energy coming from the sun. At night, temperatures plunge because there is no atmosphere to keep the heat in, as there is on Earth. The laws of physics tell us that without the atmosphere, the Earth would be approximately 33°C (59.4°F) cooler than it actually is. This would make most of the surface uninhabitable for humans. Agriculture as we know it would be more or less impossible if the average temperature was −18 °C. In other words, it would be freezing cold even at the height of summer. The reason that the Earth is warm enough to sustain life is because of greenhouse gases in the atmosphere. These gases act like a blanket, keeping the Earth warm by preventing some of the sun’s energy being re-radiated into space. The effect is exactly the same as wrapping yourself in a blanket – it reduces heat loss from your body and keeps you warm. If we add more greenhouse gases to the atmosphere, the effect is like wrapping yourself in a thicker blanket: even less heat is lost. So how can we tell what effect CO2 is having on temperatures, and if the increase in atmospheric CO2 is really making the planet warmer? One way of measuring the effect of CO2 is by using satellites to compare how much energy is arriving from the sun, and how much is leaving the Earth. What scientists have seen over the last few decades is a gradual decrease in the amount of energy being re-radiated back into space. In the same period, the amount of energy arriving from the sun has not changed very much at all. This is the first piece of evidence: more energy is remaining in the atmosphere. What can keep the energy in the atmosphere? The answer is greenhouse gases. Science has known about the effect of certain gases for over a century. They ‘capture’ energy, and then emit it in random directions. The primary greenhouse gases – carbon dioxide (CO2), methane (CH4), water vapour, nitrous oxide and ozone – comprise around 1% of the air. This tiny amount has a very powerful effect, keeping the planet 33°C (59.4°F) warmer than it would be without them. (The main components of the atmosphere – nitrogen and oxygen – are not greenhouse gases, because they are virtually unaffected by long-wave, or infrared, radiation). This is the second piece of evidence: a provable mechanism by which energy can be trapped in the atmosphere. For our next piece of evidence, we must look at the amount of CO2 in the air. We know from bubbles of air trapped in ice cores that before the industrial revolution, the amount of CO2 in the air was approximately 280 parts per million (ppm). In June 2013, the NOAA Earth System Research Laboratory in Hawaii announced that, for the first time in thousands of years, the amount of CO2 in the air had gone up to 400ppm. That information gives us the next piece of evidence; CO2 has increased by nearly 43% in the last 150 years. Atmospheric CO2 levels (Green is Law Dome ice core, Blue is Mauna Loa, Hawaii) and Cumulative CO2 emissions (CDIAC). While atmospheric CO2 levels are usually expressed in parts per million, here they are displayed as the amount of CO2 residing in the atmosphere in gigatonnes. CO2 emissions includes fossil fuel emissions, cement production and emissions from gas flaring. Spectrum of the greenhouse radiation measured at the surface. Greenhouse effect from water vapor is filtered out, showing the contributions of other greenhouse gases (Evans 2006). The graph shows different wavelengths of energy, measured at the Earth’s surface. Among the spikes you can see energy being radiated back to Earth by ozone (O3), methane (CH4), and nitrous oxide (N20). But the spike for CO2 on the left dwarfs all the other greenhouse gases, and tells us something very important: most of the energy being trapped in the atmosphere corresponds exactly to the wavelength of energy captured by CO2. Like a detective story, first you need a victim, in this case the planet Earth: more energy is remaining in the atmosphere. Then you need a method, and ask how the energy could be made to remain. For that, you need a provable mechanism by which energy can be trapped in the atmosphere, and greenhouse gases provide that mechanism. Next, you need a ‘motive’. Why has this happened? Because CO2 has increased by nearly 50% in the last 150 years and the increase is from burning fossil fuels. And finally, the smoking gun, the evidence that proves ‘whodunit’: energy being trapped in the atmosphere corresponds exactly to the wavelengths of energy captured by CO2. The last point is what places CO2 at the scene of the crime. The investigation by science builds up empirical evidence that proves, step by step, that man-made carbon dioxide is causing the Earth to warm up. Addendum: the opening paragraph was added on 24th October 2013 in response to a criticism by Graeme, a participant on the Coursera Climate Literacy course. He pointed out that the rebuttal did not make explicit that it was man-made CO2 causing the warming, which the new paragraph makes clear. The statement "...and humans are adding more CO2 all the time" was also added to the 'what the science says section. What speculative large scale effect could stem from more insulation with unchanged energy input? Could it be similar to the effect of more energy input with unchanged insulation? "The evolution of the Earth's climate has been extensively studied, and a strong link between increases in surface temperatures and greenhouse gases has been established. But this relationship is complicated by several feedback processes—most importantly the hydrological cycle—that are not well understood. Changes in the Earth's greenhouse effect can be detected from variations in the spectrum of outgoing longwave radiation, which is a measure of how the Earth cools to space and carries the imprint of the gases that are responsible for the greenhouse effect. Here we analyse the difference between the spectra of the outgoing longwave radiation of the Earth as measured by orbiting spacecraft in 1970 and 1997. We find differences in the spectra that point to long-term changes in atmospheric CH4, CO2 and O3 as well as CFC-11 and CFC-12. Our results provide direct experimental evidence for a significant increase in the Earth's greenhouse effect that is consistent with concerns over radiative forcing of climate." It essentially means that there is more heat retained in the system in the bands of the mentioned gases. It is claimed that this additional heat is warming the climate. Is that such a bold claim? Now, I'm sure Will Nitschke will find objections. This is where the logic breaks down. When ample evidence has been gathered and critics of a theory continue to refute it, because no amount of evidence can ever be satisfying and they will not state what kind of evidence would be so, or define it in a way that they know is impossible to reach. Indeed, there is no such thing as absolute certainty. "here is a clear empirical evidence that CO2 is rising, CO2 causes warming and the expected warming is observed." -Yes, Yes and No. CO2 is rising and we expect that to cause warming. But "the expected warming" is not observed. If by expected you mean that we have seen warming that yes, but not from CO2 alone. In fact, the IPCC uses "aerosols" to explain the cooling from 1944 to 1975, and kindly explain that we do not know much about the climatic impact of aerosols. So to say that the "expected" warming is observed is to mislead: the expected warming from KNOWN factors (i.e. such the IPCC says we know lots about) would have been a steady increase from 1944, interupted by a few volcanoes and La Ninas. "What is causing the warming if not CO2?" The suns irradiance, cosmic rays, a positive PDO, and a range of other factors, along with CO2. "Why isn't rising CO2 causing the warming?" Well, IT DOES, albeit not all of it, but from there, it's a long way to prove that a warming of half a degree until now will translate into an additional 5 degrees to year 2100. The following is actually pertinant to all these threads but this one seems the closest. "[ Global Warming: Has the Climate Sensitivity Holy Grail Been Found? ABSTRACT: This article addresses new satellite and modeling evidence that previous satellite diagnoses of high climate sensitivity--which directly translate into predictions of dangerous levels of global warming--contain a large spurious bias. It is shown that those exaggerated estimates were the result of faulty assumptions regarding clouds when analyzing variations in average global temperature and average reflected sunlight off of the Earth. Specifically, it has been assumed (explicitly or implicitly) that, for global averages on time scales of three months or more, temperature variations cause clouds to change, but that cloud variations do not cause temperature to change. But when properly filtered, the satellite data reveal evidence of cloud variations indeed causing temperature changes, and that this source of natural climate variability biases the estimate of climate sensitivity in the direction of a very sensitive climate system. The new interpretation suggests a very low sensitivity. If the new sensitivity estimate is accurate, it would suggest only 0.5 deg. C of manmade warming by the year 2100. The new sensitivity estimate also suggests that warming over the last century can not be explained by human greenhouse gas emissions alone, but instead might require a mostly natural explanation. ]" Changing the sensitivity number does change ecery argument all at once. "Rising CO2 levels are based not on one station but over 300 stations in 66 countries (World Data Centre for Greenhouse Gases). " My count from the WDC site is 298 stations of which only 159 actually measure CO2. The others measure different gasses. Being imprecise simply gives the sceptics another rabbit trail to run down. Current models have a VERY GREAT problem with clouds; even with modern satellite imagery it is beyond our current capability to assess with any reasonable degree of accuracy cloud distribution and density and thus the effect on insolation. Well, Beck's analysis seems to disprove the base line data used to start the whole issue, so what does that do for the AGW theory?? Even if you put a higher anomaly factor in than Beck, you still end uf with substantially higher CO2 figures than were used to construct the AGW argument. A skeptic would easily recognise that Beck's analysis is nonsense! remember that this is a "skepticalscience" site...we should make at least a little effort to be skeptical! Let me see if I understand this. This seems to be the argument. First, CO2 levels are rising. Second, CO2 is a greenhouse gas. Third, during the last 30 years, global temperatures have been rising. Fourth, the things that ordinary cause temperatures to rise -- such as increased solar activity -- are not causing the current rise in temperature. Therefore, increased C02 is causing global warming. Of these four points, I believe that no one disputes one and two. Yes, CO2 levels are rising. Yes, CO2 is a greenhouse gas. I do not think anyone denies either of those two assertions. But, there are a number of points that I think an honest scientist would want to explore. How much is CO2 rising, compared to the past? Do we have more or less CO2 now than we did in various past times? When we put more CO2 into the air, what happens to it? Does it get absorbed by the ocean, or does it stay in the air forever? What other things in the atmosphere are increasing or decreasing? I would feel much more confidence in the global warming theory if they would address points of this sort, which seem like pretty obvious questions to me. But, for the moment, lets just say that points one and two are basically undisputed. I believe that is true. Point three is the pivot the argument. The whole theory stands or falls on it. It is basically saying that there is a huge, unexplained increase in global temperatures in the last 30 years, which we have to explain. But is that true? First off, during the last ten years, there has been no increase. Of course, one can say -- and it is true -- that a ten year period means little or nothing in climate science. But think about that. If ten years means nothing, why is 30 years of such huge importance? If the whole theory rests on 30 years, but 10 of those years are AWOL, how good is the theory? And how can we say that the usual suspects do not explain the increase, when there has been no increase for ten years? What we are basically talking about is a twenty year trend, which stopped ten years ago. So what? Excuse me, but I have read enough climate science to realize that 10 or 20 year trends do not mean much. Most climate cycles operate over 100s if not 1000s of years. Response: "CO2 is a greenhouse gas. I do not think anyone denies either of those two assertions"
Sadly, there are many who deny the assertion that CO2 is a greenhouse gas, even despite observations of an enhanced greenhouse effect. Much of the discussion on this website of late have been on that topic alone. "during the last ten years, there has been no increase"
Statistically, this isn't true, the trend in global temperature has still been increasing. Don't fall into the trap of comparing single points in a noisy signal - that is not the way to determine a long term trend. More importantly, the physical reality is that the planet is still accumulating heat. There is still an energy imbalance. Satellites and ocean heat measurements find more energy is still coming in than going out. I think that this post was different in the past and included a list with some fingerprint evidence (rise of the tropopause, expansion of the hadley cell...) with links... Where can I find this? Acceleration of glaciers in Greenland and Antarctica, particularly within the last few years. Note - as you say, some of the evidence listed above are unique to CO2 warming - the carbon "fingerprint". Loads of thanks, and good new article! We have a rather good grasp of the current climate system. The only thing that has change enough to warm the planet is GHG (mainly CO2) and all the observations are consistent with that. Some people still insist that there might be some misterious unknown thing doing it (and some other unknown thing cancelling out the CO2 warming effect) even though there isn't any evedence at all. It seems incredibly twisted to me. If you want to disprove global warming just on a statistical basis you will need more than a statistically insignificant short-term cooling trend. Thanks for the thoughtful presentation of evidence in favor of AGW. I'm concerned with the logic of how you put your argument together on this page, however. Your first point is that CO2 is increasing. The second is that CO2 traps heat. OK so far. The third point is that the earth is warming. You lose me there. The reason we know that humans are causing the earth to warm is that the earth is warming? I just don't see how that logically follows. I'd really like to see a clear argument for the AGW hypothesis that separates evidence of warming from evidence for the cause of that warming. That's what I was hoping to find here, but did not. Response: The cause of global warming is outlined above in point 2: the enhanced greenhouse effect from increasing CO2. Point 3 (warming is happening) is the logical consequence of Points 1 (we're raising CO2) and 2 (CO2 traps heat). To accept the first two points, that human CO2 emissions are causing heat to be trapped, is to accept that humans are causing the planet to accumulate heat. With more heat in our climate, temperatures will rise. David Rourke, the first point is not simply that CO2 is rising. The point instead is that humans are causing the rise of CO2. Since that rise of CO2 increases heat retention, it does indeed follow that humans are causing a rise of heat retention via the mechanism of increasing CO2. Sorry if I seem dense. Allow me to make an analogy to evolutionary theory. It is observed that species change over time (evolution). Natural selection is a theory that explains how that happens. Evolution is consistent with natural selection, but evolution doesn’t prove that the natural selection hypothesis is correct. Instead, we accept that evolution happens (based on considerable evidence) and compare different explanations for what causes it (natural selection vs. Lamarckism, for example). Natural selection makes many correct predictions, while Lamarckism makes many incorrect predictions. Therefore, natural selection is accepted as true (as true as anything in science). In the same manner, once we accept global warming, it does nothing to support AGW vs. any other explanation for increased global temperatures. What testable predictions does AGW make? What testable predictions do alternative theories (such as increased solar activity) make? How do those predictions hold up when compared with facts? That’s really the case that needs to be made here, I think. Response: I had hoped that I had made a clear case above not only for global warming, but more importantly, that humans are causing global warming. If humans are causing global warming, we expect to see an enhanced greenhouse effect. More specifically, we expect to see the enhanced greenhouse effect at the wavelengths that CO2 absorb energy. This has been observed both by satellite measurements observing less infrared radiation escaping to space and surface measurements observing more infrared radiation returning back to the Earth's surface. This web site and it's articles is the best (most thorough most civil, most compact, most interesting) I have ever come across. If we agree that human-caused CO2 has has caused the increase in global temps, the more difficult problem is what to do about it. Does anyone really think the answer is electric cars? More bumper stickers? Without hyper-analysing energy issues, it seems that the underlying belief is that we need to substitute non-Co2 releasing energy with non-CO2 producing energy. Is this even POSSIBLE on a global scale? And if so? Will the surge of population over the next hundred years erase those efforts? And, is there enough time? Even if our solutions were implemented on a a world-wide scale over the next 20 years, how long would it take for the volume of arctic ice to re-establish itself and confirm our "fix" has succeeded? oops, in the last commet the first mention of "non-CO2 releasing energy" should have been "CO2-releasing energy"
we already have the technology and it's improving rapidly; the only big question is time (or probably I should say the will to act). We will never see the arctic, or any other impact we already caused, recover. It's even worst, indeed; even if we act promptly we will see more degradation of our environment. We are not even thinking of turning back to the pre-industrial climate, we're only trying to avoid what is considered too dangerous to afford. I think the Skeptical Argument is improperly presented. It should rather be presented "There is no empirical evidence or proof that humans are [the primary causes of current global warming trends]. It's all based on theory and computer models. Response: Ideally, rather than use my own wording, I like to quote an excerpt from a skeptic article - usually one that sums up the argument succinctly and eloquently (lest I be accused of setting up a strawman argument). I'll get around to it for this argument sooner or later. More to the point, are there other, more prevalent sources of CO2 outside of industrial or non-natural based carbon emissions and further, are there other elements at play in increasing the global heat capacitance currently perceived? 1) If renewable energy is to succeed there needs to be a massive price reduction in the price per kilowatt hour. My boss held up a $0.10AU coin and said that is the necessary goal for renewables to compete/ensure the economy can adjust. This site i've listed below has some figures though it might have company bias but as you can see in order for non CO2 producing forms of energy to flourish there needs to be something (ie.a heavy amount of research/investment etc) to get it there. 2) This second scenario isn't so pretty. This addresses the population issue you raised. I heard an interview with Paul Ehrlich who is a Professor in population studies. He is the author of The Population Bomb back in 1967 has some very dire predictions about world population levels. This is something I don't know but even if we could magically turn off the "CO2 emissions switch" I would think that the Artic ice loss will continue ie no matter what we do now global warming is happening and it is only a case of damage control reducing the extent in the rise of average temperatures in the future. It is wonderful to find such a detailed debate on this important topic. Can you confirm that my understand, as outlined below, is correct, or at least not nonsense. As life on Earth evolved, the Earth’s atmosphere was slowly changed. The atmosphere changed quite profoundly once the process called photosynthesis evolved. Much of the carbon dioxide in the atmosphere was sucked up by photosynthesis and transformed into oxygen and carbon. Carbon became the building material upon which life was based, and oxygen, as we all know, became essential for sustaining life. When a living thing died, the carbon that formed the building blocks of life was often reabsorbed by the soil. This fertilised the soil, making life even richer. Some of the carbon left when plant and animals died was subjected to enormous pressures, and over the aeons was turned to oil and coal. Life itself acted as means of storing carbon. In particular forests are like massive carbon storage facilities. Over millions of years, as life had the effect of reducing the amount of carbon dioxide in the atmosphere, the Earth cooled down. This was not a smooth process, and was subject to other variables. The question is this: by burning up carbon deposits that have stayed in the ground for aeons, and also through deforestation, is man reversing a process which took place over millions of years in a blink of the evolutionary eye. The assertion is made that increasing CO2 and other GHG's absorb more long wave radiation and prevent it from escaping to space. This is well supported by Harries 2001 Figure 3C. Clearly assertion this is supported by both theory and measurement. The fallacy comes into play when applying this to the WHOLE of the outgoing long wave spectrum. Looking at Harries 2001 Figure 1B (not shown), the range 800-1000 cm-1 shows an increase in outgoing long wave that exceeds the decrease due to GHG's. This observation is also present in Griggs 2004 and Chen 2007. Harries 2001 attributes this increase over the range 800-1000 cm-1 to 'small residual ice crystals' not fully removed from the data due to field of view differences between the detectors. This assertion is not supported by the addition of the NASA AIRS satellite. Additionally, satellite measurements of total outgoing long wave radiation show an increasing trend with time (and CO2, although not causative). This is critical because it calls into question the causative relationship between "CO2 traps heat" and "Our planet is accumulating heat" in the block diagram. This relationship must be solid if the alarming predictions of the climate science community are to be believed and the mitigation of climate change can be achieved through CO2 emission reduction. What are peoples thoughts on Gerlich & Tscheuschner's paper "Falsification Of The Atmospheric CO2 Greenhouse Effects Within The Frame Of Physics"? it's a more than two years old story and has been refuted so many times that there should be no need to pull it back. Give a quick look here and at the links provided. Thanks for the link. I will look over it. BTW. The original paper is two years old, this paper is Jan2009. it's basically the same, they just found it hard to get it through peer review. I have a question. I live in West Texas where just a few generations ago fires used to burn up our whole world. Before the White Europeans stole the land from my ancestors the prairies were purified and cleansed of brush and trees by fires Native Peoples and lighting set. Millions of acers burned uncontrolled every time it turned off dry and especially after a wet year when we grew a lot of grass. Since hiways, roads, cultivated lands stop wildfires today not much of the prairies burn anymore. In fact the pasture land is not grass it is trees, cactus and brush. I still hear on the news of concern about co2 and other gasses wildfires emmitt into the sky. So how can the nominal co2 emissions of industry cause the earth to warm when since fires have always been a part of the enviornment? "So how can the nominal co2 emissions of industry cause the earth to warm when since fires have always been a part of the enviornment?" Because the rate at which we are extracting and liberating carbon stored over vast periods of time is as though thousands and thousands of years of wildfires are occurring concentrated in a space of a few decades. We're performing sort of a mini version of what happens with discontinuous natural burps of C02 in the past. The difference is, we're mindful, nature is not. More precisely, by looking for carbon isotope ratios in the C02 now in the atmosphere, we can actually identify which part is contributed by normal processes of the type you refer to versus which are being contributed by "sudden liberation" of the kind accompanied by fossil fuel combustion. The measured uptick in C02 turns out be from fossil fuels. One of the few things on which almost everyone is found in agreement! I do however have to take issue as I believe you are posting a strawman. The issue is not whether or not manmade CO2 is causing warming. It is whether or not it is going to cause catastrophic warming. No serious skeptic disputes observations 1 and 2. IE, manmade CO2 is indeed increasing and that increasing CO2, absent either positive or negative feedbacks, will increase the temperature of the earth. The consensus on all sides is that a doubling of CO2, absent feedbacks, will increase the earth’s temperature by one degree. The models assume substantial positive feedbacks and per the IPCC, predict 2 to 6 degrees of warming per doubling of CO2. We are told that the reason we should believe the models ability to predict the future, is because of their ability to predict (model) the past. IE, we should believe the forecast, because the hindcast is accurate. Up until recently, I was prepared to accept the models hindcasting abilities. Until I read extracts from the leaked Harry.Readme.txt file. For any of your readers who do not know. Harry was the University of East Anglia programmer who tried to make sense of the HADCRUT code. Here is my favourite extract. But let us put that aside and assume that the hindcast is correct. So the question then is how well have observations matched the forecast. Well to start with, I being skeptical, and having read the Harry.Readme.Txt file and looked at www.surfacestations.org, will not trust the surface measurements. That leaves me with the satellite measurements, UAH and RSS, and the ocean heat content measurements, as measured by the Argos buoys. The satellites give us 30 years of data and Argos buoys just 7. So what do they show. Well UAH shows that there has been no statistically significant warming for 15 years. See http://noconsensus.wordpress.com/2009/11/12/no-warming-for-fifteen-years/. (This data can be downloaded and you can plot it yourself to verify it) RSS’s no statistically significant warming period is slightly shorter. For some reason 30 years is talked about as being the timeframe required to measure climate, so no statistically significant warming in half a climate timeframe, strikes me as important. What needs to be also pointed out in a discussion on the Satellite temperature record is that three major volcanos, two of them tropical, occurred during the first half of it. Mt St Helens, El Chichon and Pinatubo. These lowered the global temperature during the first half of the record. (Tropical volcanos have a higer impact on temperatures) This is best illustrated in a graph created by Bob Tisdale here http://i44.tinypic.com/3442jo9.jpg. What he shows is that the 1982 / 1983 El Nino was almost as powerful as the 1998 El Nino that made 1998 the hottest year in recorded history. However temperatures were masked by the effects of El Chichon. What is interesting is that, even with the volcanoes skewing the earlier part of the record, global temperatures only rose by 1.3 to 1.7 degrees per century depending on which satellite record you want to choose (and by slightly more if you are happy to use the surface records.) Having said that, Global Warming theory states that the lower troposphere, where the satellites do the measuring, should warm faster than the surface, (by about 20% per John Christy) so a 1.3 degree per century rise in the Lower Troposphere is equivalent to 1.1 at the surface. And now to get to Ocean Heat Content. I do not trust any measurement before the Argos buoys were deployed in 2003. Since then ocean heat content has remained flat See http://bobtisdale.blogspot.com/2010/01/nodc-ocean-heat-content-0-700-meters.html . It should be pointed out too that the thermal mass of water is a lot greater than that of air, so the variability of Ocean Heat Content is less. Therefore conclusions can be drawn from much shorter periods of Ocean Heat Content than Surface Temperatures. We have 7 years which is a quarter of a climate timeframe, and so far, no warming. So to summarise. I will believe it when 1) An engineering audit is done on the surface temperature records and they are revised or confiremed. 2) The models continue to accurately hindcast and 3) 15 years of satellite measured temperatures match the model predictions, or 8 years of Ocean Heat Content measurements match the model predictions. Or they find the missing tropical hotspot fingerprint of manmade catastrophic global warming, but that is another days discussion. Response: "No serious skeptic disputes observations 1 and 2. IE, manmade CO2 is indeed increasing and that increasing CO2, absent either positive or negative feedbacks, will increase the temperature of the earth"
I wish that were true. I list a selection of skeptic articles arguing that human contribution to atmospheric CO2 is tiny and that increasing CO2 doesn't cause much warming. Ian Plimer who I'm sure considers himself a serious skeptic argues both points in his book Heaven and Earth. You do make a good point though. I thought ending this article with 'the planet is accumulating heat' was sufficient to show humans are causing global warming. However, I think an extra step is now required, something to the effect of 'extra heat causes surface warming' (I'll work on a less clumsily worded version). In other words, that our climate is sensitive to radiative forcings. I would base this not on models but on the many papers looking at empirical data of temperature change versus forcings to calculate climate sensitivity. It sounds as if you've been badly misinformed. Next, before accepting and counting on what you read on Anthony Watts' site, take into advisement that Mr. Watts was unable to discern the difference between temperature trends versus absolute temperature measurements. He thus was misled into making many embarrassingly wrong statements regarding the temperature record in the United States, as well as launching a large volunteer effort in an attempt to prove his fallacy. Output of his project actually helped to cement the simple wrongness of his incorrect hypothesis. You should also take a closer look at the ARGO buoy data, from an authoritative source. 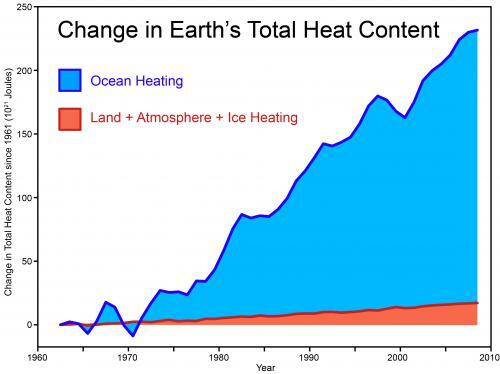 Ocean heat content has actually increased since the inception of the ARGO program. It's rather inexplicable that anybody should think otherwise at this late date. Having taken all that on board, it would be good to rethink your conclusions. the strength of the AGW theory and the reason why no one has succeded to falsify it and and make a new one is that there many lines of evidence pointing to the same conclusions. As it happens, I don't think Plimer is a serious skeptic. His inability to acknowledge the Volcano error is an embarrassment. Interestingly, since I posted this, no less a personage than Phil Jones has confirmed that there is no statistically significant warming for 15 years - remember that is half a climate timeframe. His BBC piece also acknowledges the presence of volcanos in the earlier part of the Satellite record but does not draw the obvious conclusion that I did. IE, volcanos in the firest half depresses temperatures, no volcanos in the second half increass them, run a trend line over the full period and you get warming. Thanks for the Schuckmann link. Will go off an read it. Phil Jones is a serious scientist in fact. If you read the whole answer, he says that there's a trend but it is "just" not statistically significant, and explains why. For sure he's not the kind of man that picks up an arbitrary time span and cry no trend! no trend! David Rourke (on 3 December, 2009) is right, and the responses to his posts are wrong! He points out a flaw in the argumentation. Faulty logic should not be used to prove the AGW theory. Those who opposed his criticisms did not understand basic logic. The assertion 'A implies B' says that if A occurs then B also occurs, but it does not prove that B is always caused by A. If we observe B, we cannot be sure that the reason is A. Example: We know that the burning of tyres causes black smoke, but if we see black smoke in the distance, we do not know that it comes from tyres burning. There could be other sources. An example from using climate data: there was a major period of continuous global warming from 1900 to 1940. This would seem to prove that our grandparent generation burned maybe even more oil and coal than we have done the last 50 years, since global warming obviously did occur, and since increased CO2 in the atmosphere is known to cause global warming. But they did not! They added considerably less CO2 than we do now. So there must be other explanations to global warming that have to be considered. By the same token there could be other mechanisms in action that counteract the effect of the (documented) increase in CO2, e.g. the oceans warm up, more water vapour in the atmosphere, more clouds, less radiation reaches the surface - result: global cooling or return to status quo. did you ever imagined that there's not just CO2 around? Did you noticed that you (as opposed to the climatologists) are using the wrong logic that because there has been warming in the past (not anthropogenic for sure) current warming can not be due to CO2? Did ever read a general climate paper where all of what you cite ("e.g. the oceans warm up, more water vapour in the atmosphere, more clouds, less radiation reaches the surface") are give the due importance? Can you really belive it's so easy to dismiss a theory that has passed through decades of scientific scrutiny before being widely accepted? Figure 2C from Harries 2001 is being used to show that outgoing long wave radiation is decreasing as a result of CO2 and other greenhouse gases. Figure 2B (not shown) indicates an increase the range 750-1000 cm^-1. The net effect is an actual increase in OLR over time. This increase is shown spectrally in the other papers mentioned as well (Griggs 2004, Chen 2007). Although Harries 2001 writes it off as contaminated data - it is a real measurement and not an artifact (Griggs 2004). The increase has been measured in other satellite measurements of total OLR. The total OLR is increasing over time, not decreasing. The Earth's radiation balance is a function of the TOTAL OLR, not just the OLR in the CO2 band. It is a fallacy of composition to conclude that a reduction in the 15 um OLR is CAUSING Earth's warming when the TOTAL OLR is increasing. At most you could assert that the decrease in 15 um OLR would exacerbate warming caused by ANOTHER SOURCE. the increased absorption at 600 cm-1 due to CO2 together with the increase of the thermal radiation from the surface are indeed compatible. The former is a measure the extra heat trapped, the latter of the increased surface temperature. The overall OLR increases/decreases if the planet is out of equilibrium and is warming/cooling. Yes, I know there ''there's not just CO2 around''. That is exactly my point. Alarmists are currently blaming everything on just some added ppm:s of CO2, where there obviously also exist other explanations of, and reasons for, global warming. And no, I did not use 'wrong logic'. I did not claim that current warming 'can not' be due to CO2. I just said that there could be other reasons as well. Riccardo uses 'wrong logic' when he blames me of something I did not claim. Apparently Riccardo is not familiar with the language of logic (A implies B, and so on), or he would have seen my point, instead of jumping onto something I did not write. I was simply pointing out (as has others before me, se comments 2, 7, 10, 12) that you cannot prove backward implication, from the knowledge of existing forward implication. I will expand upon my own smoke example: We know that tyres burning cause black smoke. Suppose we know beforehand that burning of tyres is taking place in a suburb. Suppose we see enormous amounts of smoke from a distance. The alarmist would then say: 'Oh my, what a lot of tyres they must be burning!'. Yes, some smoke did come from the tyres, but what we did not know was that 98% of the smoke came from a chemical factory that was on fire. you can make all the hypothesis you wish but science teach us to test them. You cannot not simply say there could be other unspecified causes; name them, test them. "obviously also exist other explanations of, and reasons for, global warming." I agree and this is exactly what has been done for decades by scientists. So please start from here, give other possible explanations and test them. Unless you prefer the kind of nihilist state of mind that becasue we can not know the "Truth" we know nothing. The beauty of climate science is that it will take at least 50 years to prove or disprove any claim that is made today, and by then most of us will be dead anyway. You cannot test a climate theory in real life, on the real globe itself, unless you allow for a time scale that is too long for a human scientist. Sure, I can build a computer model to 'test' my theory, but a computer model only yields the results I want - the results that I have built into the model, and using the parameters that I have chosen to feed it with. you do not need any computer model. Pick up the hypothetical forcing of you choice, take the available recent or paleo data and see if they match. You really need to do it before assuming it could be something else and stand there forever. Argus, you'd be comforted if you have a fuller understanding of how these models are constructed. Doug, thanks for the interesting links to essays on climate model history! I have read it all, and learned that modelling has been a challenging area for more than 100 years. Also that the models have all been very different from each other, full of flaws and weaknesses, and afflicted with serious simplifications that diminished their value. Gradually the models seem to agree more and more with each other, which is hardly surprising since consensus is the key to progress here: you get your report published if it gives similar results as all the other reports, and if you don't agree you will be an outcast in the world of climate science. I am not much comforted, though. Climatologists don't have a very good reputation anymore, after recent scandals with emails, and the glacier bluff. I predict more awkward revelations to be made in times to come. Argus, thanks for reading those. You and I differ on our interpretations of outcomes of the narrative, particularly as regards conformist thinking infecting science, but I'm really glad you took the time to grind through it all. As to email, reputations and the like, physics and mathematics are oblivious to such things; inconsistencies and errors will inevitably reveal themselves if such there are and that process will not take place via newspaper articles. "Gradually the models seem to agree more and more with each other, which is hardly surprising since consensus is the key to progress here: you get your report published if it gives similar results as all the other reports, and if you don't agree you will be an outcast in the world of climate science." Actually Nobels, and other types of recognition, are not awarded for confirming previous work. Another interpretation of why the models are converging, is that they are converging on a demonstrable phenomenon - much as models of the structure of matter converged on the atomic, vs continuous, nature of matter at the end of the 19th century. Response: Thanks for the tip. It's a shame, a full paper of Griggs 2004 no longer seems to be online so I had to link to the abstract. I'm really glad there is a site like this where we can have civilized discussions about this topic. The information I would like to address is that greenhouse gases absorb only certain wavelength bands. Hence, there is a maximum amount of energy that can be absorbed out of the electromagnetic spectrum by the greenhouse gases. This means that there is a concentration threshold for each gas whereby if the concentration increases, no more radiative forcing is possible for that gas. E.G. If you look at CFC-11 and HNO3 in the figure at the top of the page, their radiances in the bands of 850-900 cm^-1 are near zero. Therefore, increasing the concentration of HNO3 in the atmosphere will not affect radiative forcing anymore because there is no more radiation to absorb. Now don't get me wrong, I'm not saying increasing the concentration of chloroflourocarbons and nitric acid in the atmosphere has no maleffects. Acid rain and ozone depletion are two major problems with those pollutants, that is why they are regulated. But with respect to CO2, there is a limit to the amount of radiative forcing that can occur. Another note is that radiative forcing does not take into account the effects of clouds. If more energy is absorbed, more water will evaporate and convect to the upper atmosphere forming clouds that will reflect radiation. Looking at Ramanathan et al (Science 1989) "Cloud-Radiative Forcing and Climate: Results from the Earth Radiation Budget Experiment," the effect of clouds has a net radiative cooling effect. Hence, the direct correlation between a greenhouse gas increase and an increase in temperature is unfounded due to the radiative cooling of additional cloud cover. About the heat content increase graph, the comparison of 190,000 GW increase should not be compared to nuclear power plant outputs of 1 GW but rather of the amount of insolation hitting the earth from the sun of 160,000,000 GW. That is the correct normalizing parameter. I go into detail about this on the global warming page. kwoods01 writes: The information I would like to address is that greenhouse gases absorb only certain wavelength bands. Hence, there is a maximum amount of energy that can be absorbed out of the electromagnetic spectrum by the greenhouse gases. [...] with respect to CO2, there is a limit to the amount of radiative forcing that can occur. A couple of points. First, we're nowhere near saturation for CO2. Second, even if the atmosphere as a whole were saturated, CO2 would still be low enough in the upper atmosphere for OLR to escape even within the absorption bands. There are references to a number of papers about this on John's page Is the CO2 effect saturated? and much more discussion at RealClimate. "Satellite and surface measurements find less energy is escaping to space at CO2 absorption wavelengths. " It would seem to me that the total radiation outgoing is the critcal number. Of course CO2 would absorb in its natural wavelengths, but that doesn't mean an equal amount of energy isn't going out at other wavelengths. philc, see John Cook's "Response" in the green box below this comment. (1) In the pre-industrial atmosphere, total solar irradiance is in balance with outgoing longwave radiation, giving the earth some normal temperature T.
(2) When we add CO2 to the atmosphere, this reduces outgoing longwave radiation in the CO2 absorption bands. (3) The earth then warms, causing more radiation to be emitted in wavelengths that aren't absorbed by CO2. (4) Eventually, outgoing radiation is again in balance with the incoming radiation, but with less of it being emitted in the CO2 absorption bands, more of it being emitted outside those bands, and a higher surface temperature. This is not actually a perfect description of what's going on, but it's fine at the conceptual level IMHO. This is not empirical evidence of global warming. All you have done is air some empirically unproven theories that may account for the current warming and refused to consider that the same effects may be completely independent of the increase of CO2 in the atmosphere.